ARTISTS and gig goers be warned - there is a new dictator upon the horizon and we are afraid you're going to want to conform to this one. Abandon is a fresh, alternative club night broadcasting the most desired underground music in some of the most obscure places in and around the city of Manchester. The nights consist of junked up psychedelia, new wave funk and heavy going alternativia - focusing on what us Northerners do best, creating that wholesome grit all the while bearing in mind the exclusivity of the artistry. A students go-to destination has to be an Abandon club night, especially in 2014 were shoddy interiors are now beautiful locations for some of the most intimate, mind expanding gigs you could possibly imagine, topped off by DJ's who would never commit musical sacrilege of playing the tasteless trash of the chart industry. The 20th September introduces six of the most fiery artisans in the North West at the moment - Devil In My Bones to Black Sonic Revolver who are guaranteed to turn the lighting all the way down with their gutsy rhythms. 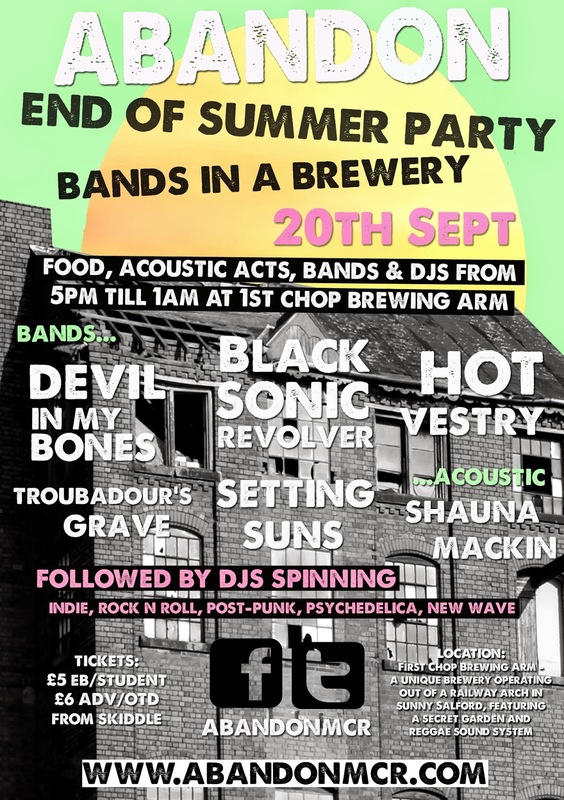 There will be food, alcohol and music all from 5pm taking place in a brewery operating out of a railway arch in Salford, perfect for a night away from the chores of Uni or work commitments, all the while being incredibly cheap - a fiver for early bird and students or £6 on the door. With their next night at First Chop Brewing Arm looming and our absolute fascination surrounding the project as a whole, we grabbed an interview with the leading lady, Sophie, to find out what goes on behind the scenes at Abandon. How did the whole idea of Abandon come about? It was a combined love of music and old abandoned buildings. I live in Ancoats in Manchester which is crammed full of old, interesting mills, warehouses etc and thought it would be a cool idea to throw a gig in one of them. We started to expand the idea to any strange space such as basements, railway arches – anywhere you wouldn’t expect to see live music. You say you reclaim strange spaces for your nights, is actually buying a venue in your sights? Yes we’d love to permanently take over an old warehouse! The next step for Abandon is find our own strange space and rent it for the summer, this is something we’d like to do next year. Eventually we’d love to campaign to save an abandoned building, raise the funds to buy it and turn it into something creative for the city’s music scene. Do you feel more needs to be done with our underground music scene in the North West? Yes definitely, the North West surely churns out the best music in the country?! It would be great to have a music TV show based in Manchester that focuses on local and unsigned music from the North West. Each city needs to recognise the musical talent that comes from the area and support it. People need to turn off Radio One and X Factor and get out to watch and support a local band. There are a bunch of amazingly talented unsigned bands out there, who are working hard and deserve/need our attention more than these talent shows. Obviously, there is a lot of controversy around dangerously lethal substances these kind of nights, what policies do you have in place to try and quell this? We don’t tolerate drugs and have bouncers and security at our nights that carry out searches – we haven’t had an issue with drug taking so far. If a band wants to have a part in one of your nights what should they do? They can email us at AbandonMcr@gmail.com we’re always on the lookout for bands for future lineups. What message would you like to get across from Abandon? Abandon isn’t just a gig – it’s a mad party, where people watch bands then have a dance after. You can stay all night, compared to most gigs where you’re chucked out as soon as the last band finishes - when you’re still buzzing and with nowhere else to go. On top of the live music and partying, Abandon is always in a strange and exciting place, which creates an unforgettable and unique experience. Big night on 20th September, what do we need to do to come along? What are we going to expect from Abandon in the future? As well as aiming to have our own space, we’re planning to throw random pop-up Abandon parties in parks, coffee shops, hotels, shops – places where you wouldn’t expect to see live music. Anywhere we can infiltrate we will do it!